At my house we have been eating a version of this ‘pasta’ every few days for the last few weeks. I don’t know if it’s the seasonal call from the artichokes (or the asparagus!) but something about it tastes very good right now. It’s about this time of year that I regain my fresh artichoke processing skills and get reasonably fast again. It’s like any seasonal sport, after a year you might feel a little bit wobbly, but it always comes back after a bit of practice. If artichokes aren’t a sport you’ve tried yet, I encourage you to give them a shot. I have written instructions in the recipe section. Fresh artichokes barely resemble their canned, brined counterparts that we seem to be more familiar with. I love them almost as much as I love potatoes, except that they love me back, so it’s obviously a healthier relationship. They are rich and buttery, sweet and satisfying (except when they are raw; taste your fingers after chopping one up and you’ll know what I mean). 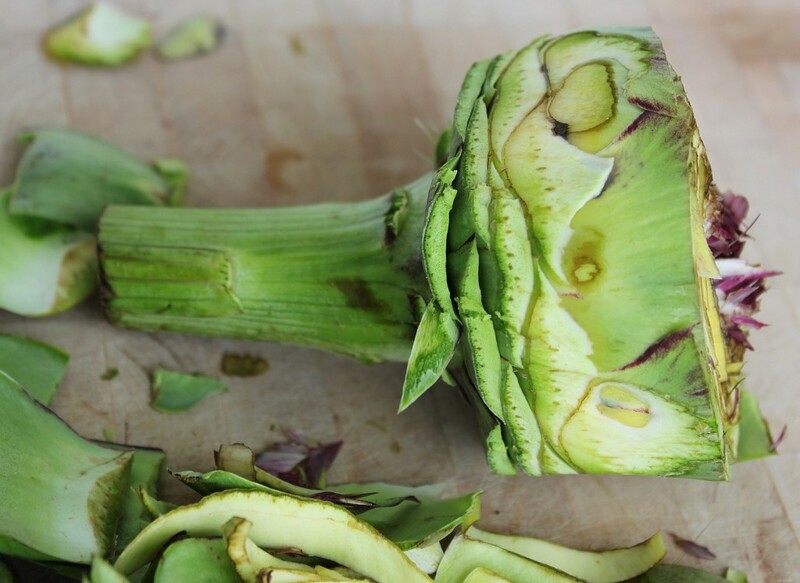 If you are a fresh artichoke rookie and need a bit of encouragement, give this recipe a try first, it’s pretty simple, and then you can decide if you want to take your artichoke relationship to the next level. Artichokes taste so good that I loved them well before I knew any of this: they are anti-carcinogenic and extremely high in antioxidants, even more so than most vegetables. 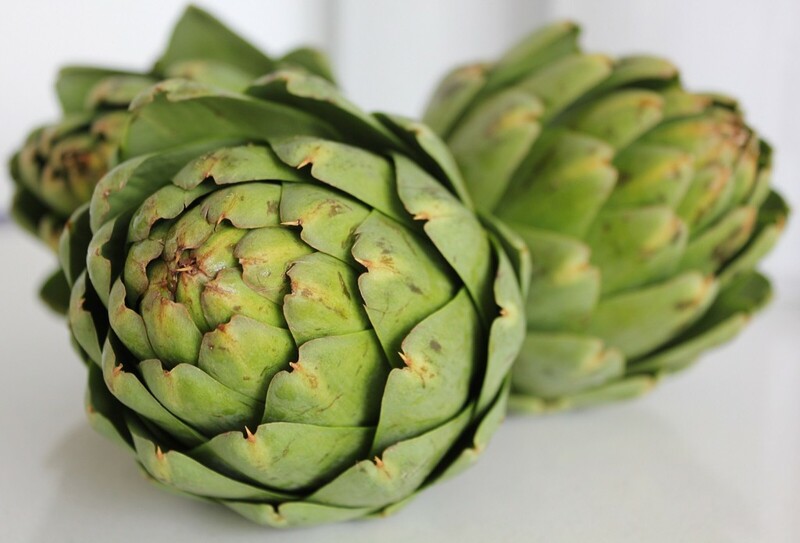 Eating an artichoke is a full-on glutathione party, the kind that cancer cells hate. 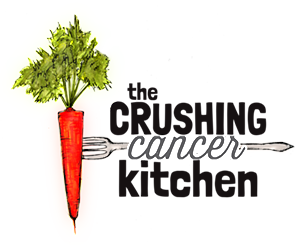 They are also a blood tonic, so they help to build energy and are also good for anemia, both very helpful to most people but especially helpful if you are battling cancer. 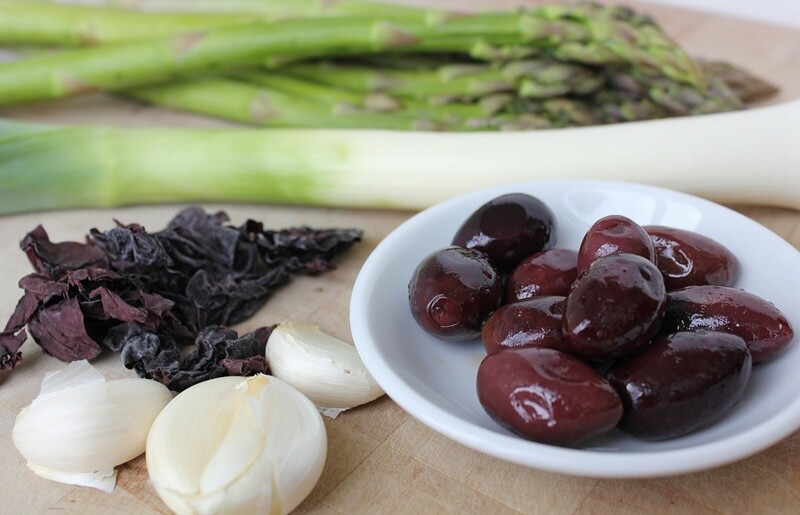 This healthy celebration doesn’t end at the artichoke, we also have fresh, green asparagus (immune-boosting, antioxidant-rich, anti-carcinogenic), lots of garlic and leek (antifungal, immune-boosting), olives (healthy fats), dulse (millions of minerals) and fresh basil (more antioxidants and antimicrobial powers). This is all great news but it’s not what you’ll be thinking about while you eat this dish. It will more likely be, ‘where in my garden can I make room to plant artichokes?’ or ‘I wonder how long it will take me to get really fast at artichoke butchery?’ or, the most realistic option ‘Mmmmmmmm’. 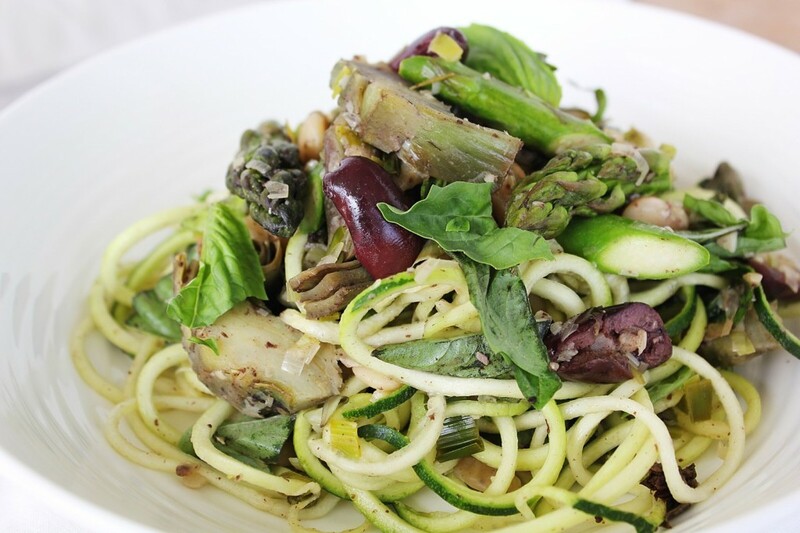 I wanted this dish to have a pasta-like feel without refined flour, high-glycemic pasta, so I am serving it with zucchini noodles (see how to make these happen here). These give us 80% of the pasta feel, while still just being that easy going, not overly popular, pretty easy to grow yourself vegetable, zucchini. While being a brilliant sub for real pasta in many ways, it lacks protein, as does the rest of the dish, so I added some beans too. I am using butter beans (aka lima beans) because I like their texture for this, but feel free to use whatever your favourite bean of the moment is. 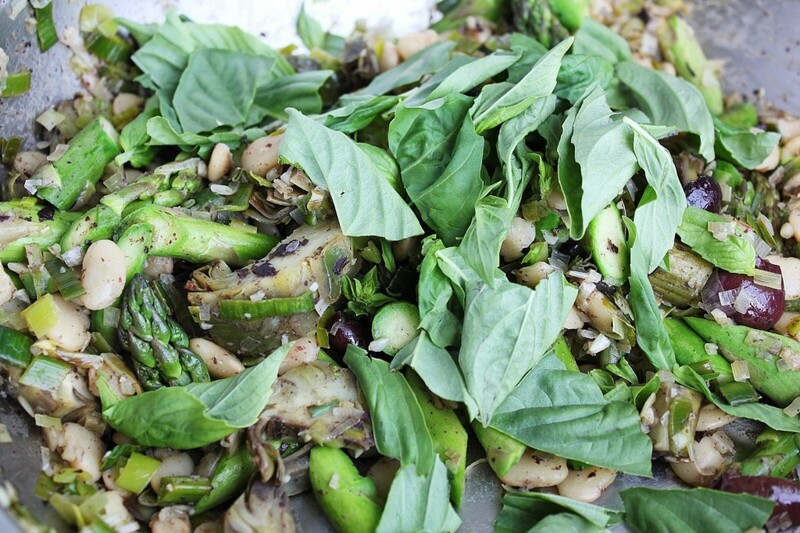 Or even better, use fresh favas once they start showing up at the farmers markets! If artichoke and asparagus season is nowhere in sight where you live, but you still want to make this recipe (I don’t blame you), cauliflower would sub in really well for artichokes, with some broccolini or rapini standing in for the asparagus. 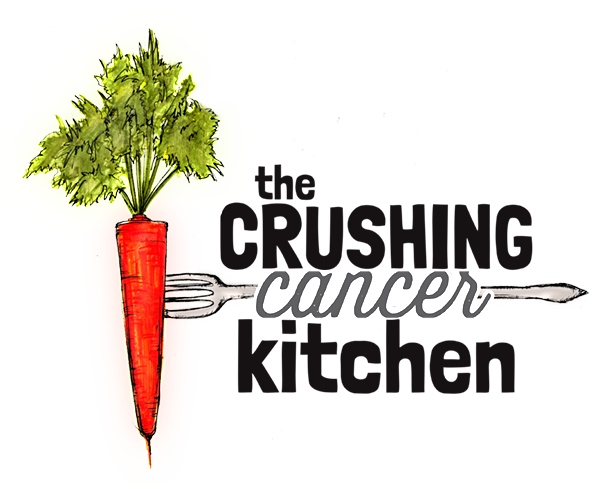 Cancer cells hate these guys just as much. I don’t want to pressure you, it isn’t entirely necessary to top this dish with nut-based parmesan cheese in order to fully enjoy it, but if you do, it might change your life. It is possible that you will stop yearning for the pasta at that perfect little trattoria up the street from you where they know your name, and start marveling at how truly amazing you are for making yourself a meal that tastes AWESOME and is somehow also very good for you. 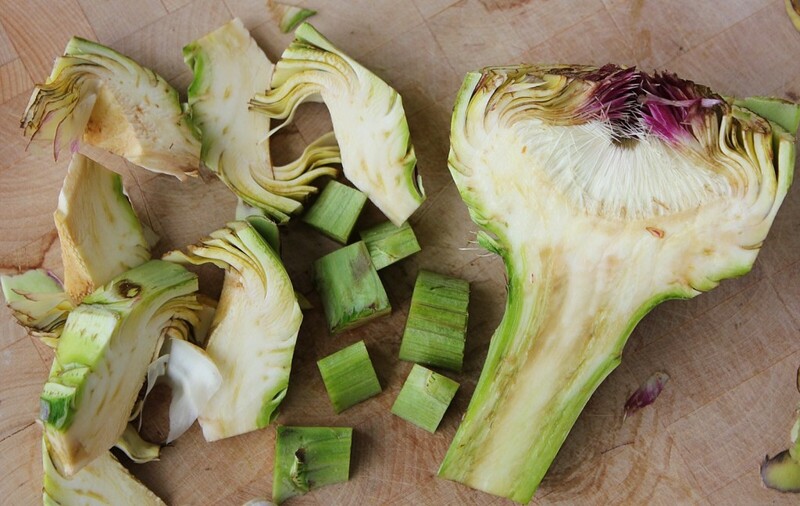 Using a very sharp or a long serrated knife, saw the top ⅔s of the artichoke leaves off the top (horizontally). Using the same knife, slice about ½ inch of the leaves off from around the outside, in a circle. 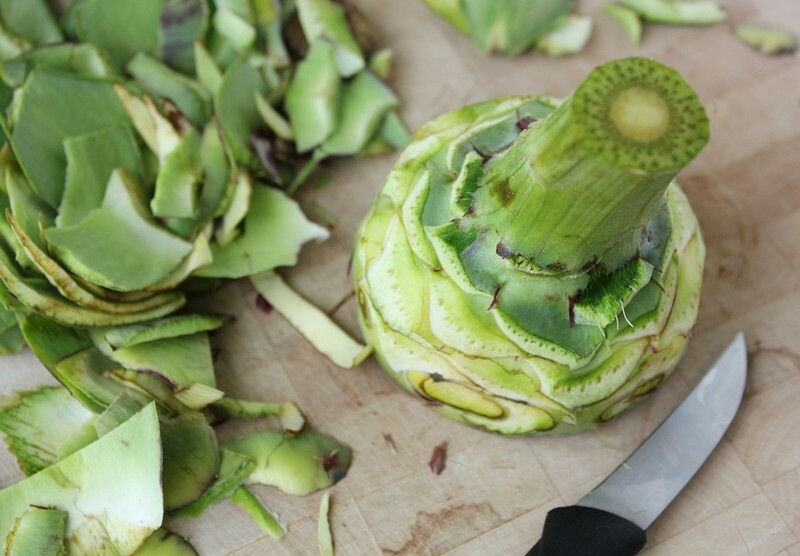 Slice the artichoke in half, vertically, through the stem and the heart. 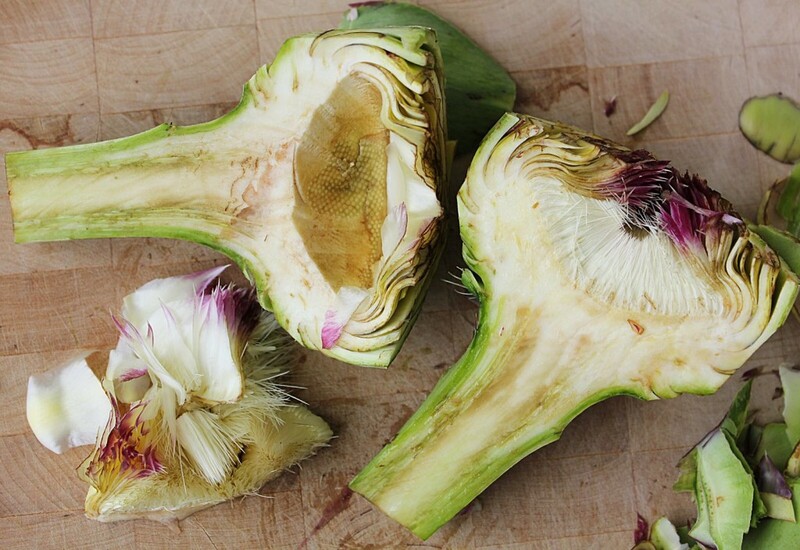 Using a paring or small knife, slice the just below the fuzz in the heart of the artichoke and remove all of the fuzz and the spike-topped purple leaves (these are easier to pull out once you remove the fuzz. Cut off the stem and dice it up and then wedge up the remaining heart. I swear this will get easier. 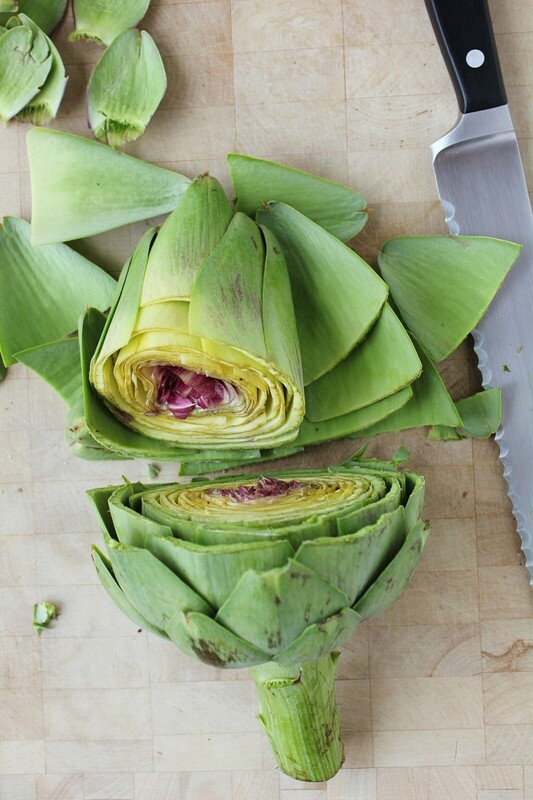 If you're slow, the artichoke will oxidize, which is ok, but you can also rub lemon on it as you go, which helps. Good luck and watch your fingers! 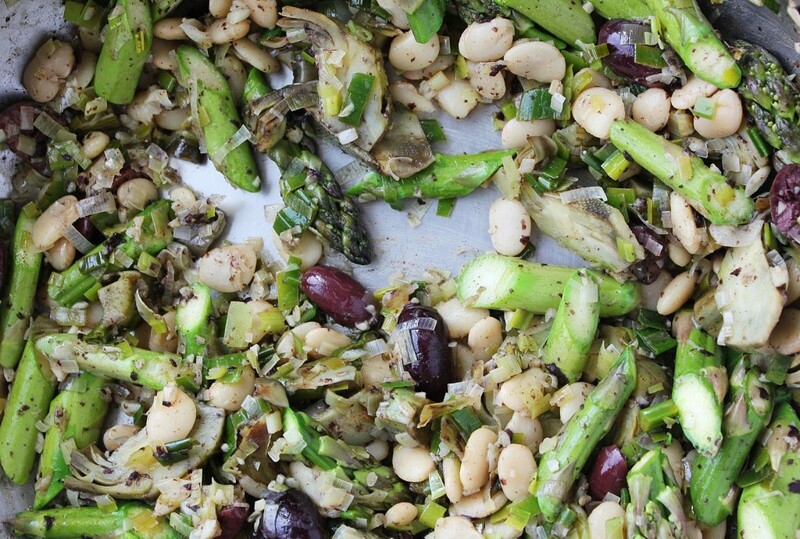 In a large frying pan on medium heat, melt the coconut oil and add the artichoke. Sauté for a few minutes and then add 1 Tbsp of lemon juice and ¼ c of water, put a lid on top. After a minute or so, take the lid off and add the leek, garlic, dulse, (and optional chili flakes) sauté until the leek has softened. Add the butter beans, olives, lemon zest and another ¼ cup of water. Sauté until the beans have warmed through. Add the asparagus and sauté for another minute until it turns bright green. Turn the heat off and add the extra 2 Tbsp of lemon juice and fresh basil, stirring together. 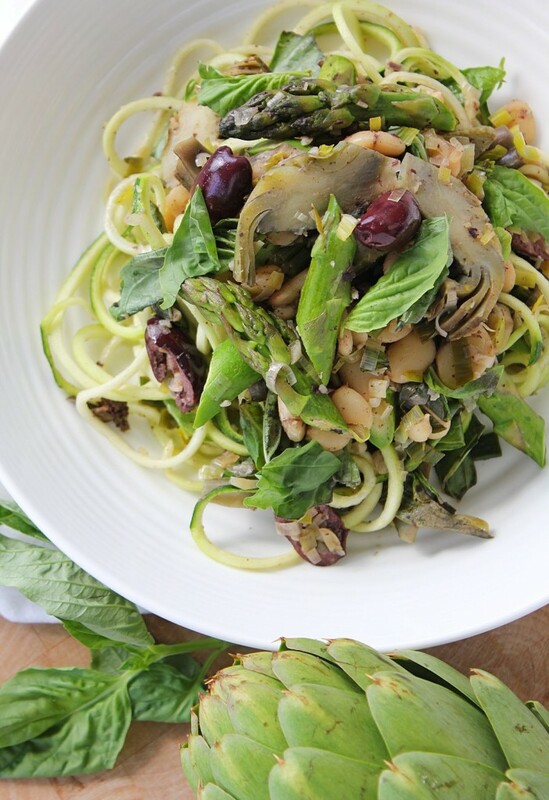 Toss with or spoon on top of the zucchini noodles. If you love yourself, top with homemade nut-based parmesan cheese.